Summon: Battle an enemy creature. When Trouble Seeker takes damage, he deals that much damage to you. Trouble Seeker is a rare Strength creature card. It is part of the Isle of Madness story set. "Bring it on! I'm ready!" 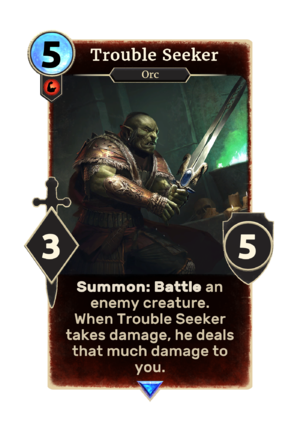 The card depicts Grommok gro-Barak from the Shivering Isles expansion for Oblivion. Here you can see him wielding Duskfang, which he originally found. This page was last modified on 25 March 2019, at 11:44.